The company's transformation into a building and security products company is being overshadowed by economic weakness. 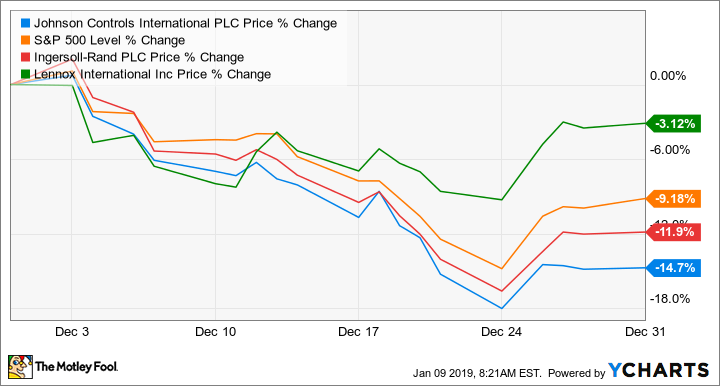 Shares in Johnson Controls (NYSE:JCI) slumped 14.7% in December according to data provided by S&P Global Market Intelligence. The company was a victim of negative sentiment around the Asia-Pacific region and in particular news of slowing growth in China. Having decided to sell its power solutions (automotive batteries) to Brookfield Business Partners (NYSE:BBU), the company will now be even more focused on its building solutions: heating, ventilation, and air conditioning (HVAC), fire safety, and building controls. Unfortunately, it's this sort of business that will suffer if there's a slowdown in the global economy. Check out the latest Johnson Controls earnings call transcript. What's more, Johnson Controls has significant exposure to Europe and the Asia-Pacific region. For example, around 41% of its building solutions sales go to these regions. Given that Europe and Asia have experienced weakness recently, at least according to FedEx and Johnson Controls' peer Emerson Electric, it's not surprising to see weakness in HVAC companies with global exposure such as Johnson Controls and Ingersoll-Rand. However, it's interesting that a U.S.-focused HVAC company, Lennox International, performed relatively well. There's little Johnson Controls can do about global macroeconomic trends and trade disputes. Moreover, the disposal of power solutions -- a business that generates more than 70% of its sales from the aftermarket -- is only going to increase its cyclical exposure. That said, it's far from clear that the weakness in China won't prove temporary. China could decide to comply with international norms of trade behavior and make the structural reforms that Trump is demanding in order to ensure fair competition. In common with the rest of the market, Johnson Controls investors are just going to have to wait and see what happens with global growth. The first-quarter results could show some negative impact, and a resolution to the trade conflict is unlikely before Johnson Controls reports its next results in early February. In a sense, it's a pity that the trade war has overshadowed events, because the sale of power solutions and the ongoing integration of Tyco is completely transforming the company into one focused on building products. That alone makes the stock worth looking at closely.